Don Wilcock has our feature interview with Lonnie Shields. 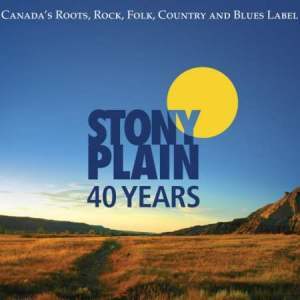 We have 7 Blues reviews for you this week including new music from 40 Years of Stony Plain, Bing Futch, Paul DesLauriers Band, The Mighty Mojo Prophets, Angel Forrest, Steve Hill and Eric Bibb and North Country Far with Danny Thompson. A sampler spanning 40 years of great music deserves 3 full CDs. 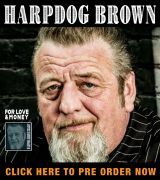 This fantastic Canadian roots label has produced some fantastic stuff over the years and is one of the top blues record labels on the planet. The CD set features three collections of music with differing slants. The collection spans their 40 years and features blues, swing, R&B and a host of other roots styles. This independent label has maintained a standard of high quality while nurturing new artists and sounds. It is a testament to the dedication and hard work of Holger Petersen and his small but talented staff. CD One is Singers, Songwriters and much more. Classic country like Emmylou Harris and Rodney Crowell are featured as are blues greats and fantastic acts like Eric Bibb, Harry Manx and Kevin Britt, Colin Linden, and so many more. Steve Earle makes an appearance here as do the Blind Boys of Alabama, Taj Mahal and Ruthie Foster when they sat in with Eric Bibb. 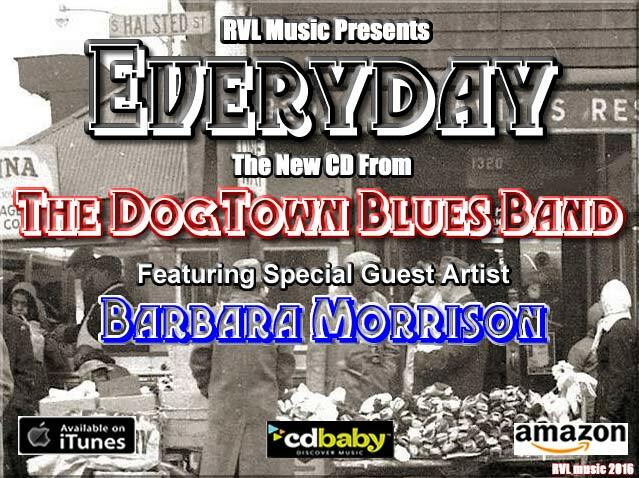 CD Two is entitled Blues, R&B, Gospel, Swing, Jazz and even more. 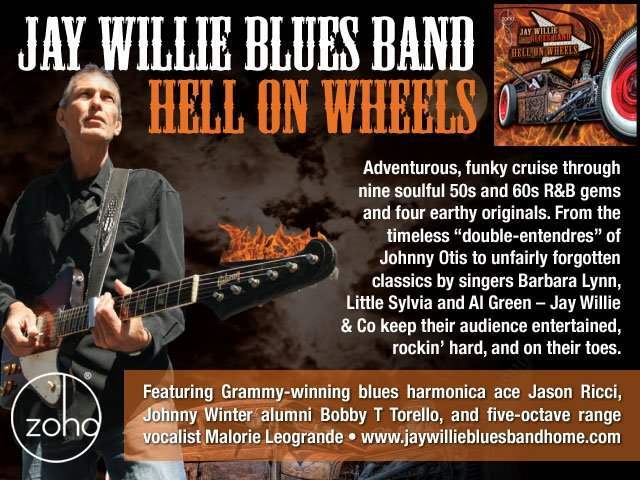 Joe Louis Walker, Ronnie Earl and the Broadcasters, Jeff Healey, Bill Boy Arnold, Rory Block Ruthie Foster, Big Dave McClean and Kenny “Blues Boss” Wayne are just some of the 19 artists featured on this CD. This CD ranges from Roscoe Gordon to Monkey Junk- eclectically cool stuff! The third CD is called Rarities and Previously Unreleased Material and features Duke Robillard, Eric Bibb, Maria Muldaur, David Wilcox, Sam Chatmon and His Barbeque Boys, Bob Carpenter and Walter “Shakey” Horton with Hot Cottage. This was my favorite of the three, but all of them were really good. This is a great set of representative tracks from this superb label. If you need to get exposed to that Stony Plain has released, go no further than this. This Is an exceptional set of tunes culled from almost 400 a;bums that they have put into production. Kudos to them and here is to another 40 years of great music! This album is one you will either embrace for the exclusive use of dulcimers in this collection of blues songs, or you will not quite follow the dulcimer sound down the blues highway. Bing Futch is known as one of the foremost dulcimer players in music today. 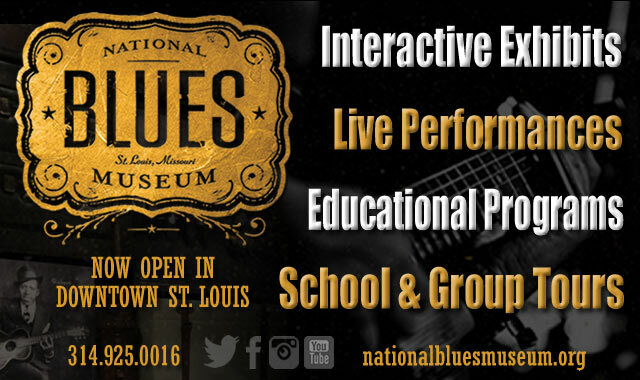 He has been playing professionally since the mid 1980’s in various bands as well as hosting workshops across the country and authoring instructional books including, Blues Method for Mountain Dulcimer 101. 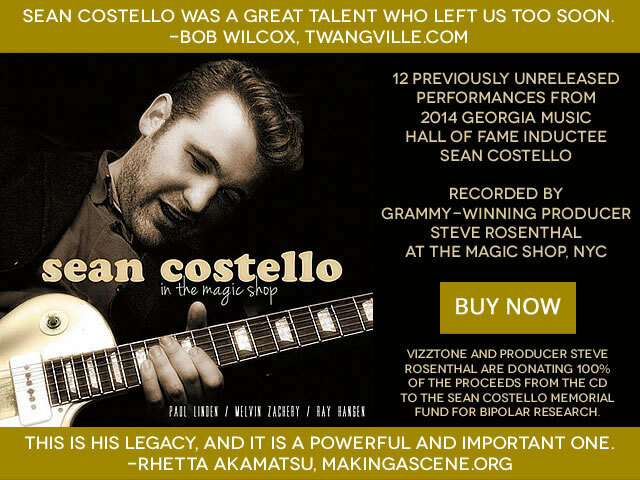 He has been a featured performer at many blues and folk festivals and opened for the likes of Molly Hatchett, the Nitty Gritty Dirt Band and bluesman Scott Ainslie. In 2016, at the prestigious International Blues Challenge, Bing won the “Best Guitarist” award. He was the first dulcimer player to ever win the award. Bing travels extensively, performing and promoting the dulcimer as a blues instrument. 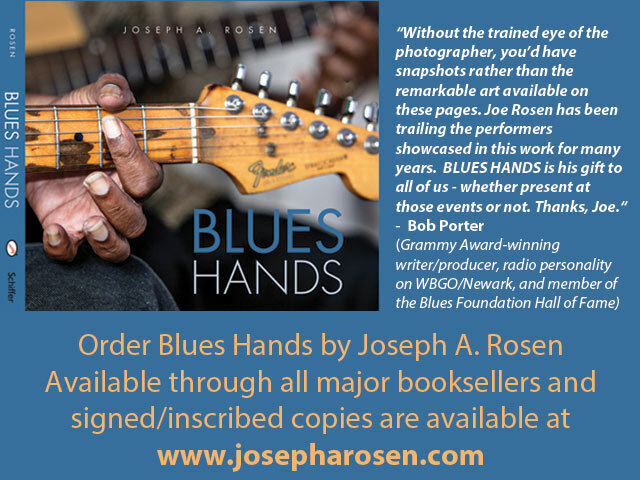 Unresolved Blues provides a good overview as he includes covers of blues standards such as the Robert Johnson classic “Sweet Home Chicago” as well as blues songs he has written. On the album he plays the mountain dulcimer, a resonator dulcimer and is backed on a few songs by Band-in-a-Box Real Tracks. The sound is unique and his mastery of the dulcimer is nothing short of sheer artistry. Overall, Bing Futch has done a remarkable job expanding blues music to include the dulcimer. I’m not convinced it works with all the songs, such as “Sweet Home Chicago” where it seems a bit too pretty or sweet for this classic song. However on the cover of “It’s Tight Like That” by Tampa Red and Georgia Tom, the resonator dulcimer slide work by Bing is excellent and gives this song a lively and classic feel. Bing included two old traditional songs on the album, “John Henry” and “Juke Joint Hen” ( aka “Cluck Old Hen”). The dulcimer brings a warm, old feel to these songs and a beautiful texture. While not quite blues songs, they were precursors to the blues as work songs. Bing gives them both a bluesy feel on this CD. The songs penned by Bing for this CD, such as “Drinkin and Driven Blues” are well written classic blues songs. it is quite obvious that Bing is well versed in blues music and very comfortable writing in Delta Blues, shuffle and boogie-woogie styles. “Drinkin and Drivin’ Blues” tells the story of a man who drank a bit too much whiskey and gin and sets off by car to visit his woman and instead visits the police. Bing’s vocals are excellent, he sings the blues very well and the dulcimer easily replaces the guitar and adds depth to the song with well-placed solos. I think the song (and the others using back tracks ) would be better without the Band-in-a-box Real Tracks, Bing’s talent is strong enough to carry the song solo without the backing track. I’d really like to hear him front a live drummer and bass player instead, although he is quite capable of providing both rhythm and a bass line on the dulcimer. The two strongest songs on the album are “That’s What You Done to Me” and “The Flip Side”. Both were written by Bing and feature him on the dulcimer without backing tracks. They are both a bit swampy and his vocals have a great gritty tone. “That’s What You Done to Me” has a very catchy riff as he describes in graphic lyrics how his woman has hurt him, “have you ever seen a bird shot down from a tree”. “The a Flip Side” describes running with the devil then deciding not to run with him no more, ” I’ve got a mojo in my pocket and a cross inside my case and I will use them on that rascal if he shows his ugly face”. These songs are catchy, well written and feature the dulcimer as a worthy companion to Bing’s strong vocal delivery. “Red Headed Lover” a shuffle-like track and the title song, “Unresolved Blues” a rocking blues song with a full sound are also excellent tracks on this album. With Unresolved Blues, Bing Fitch has proven that the dulcimer is an instrument well suited for the blues. Through my research into the dulcimer and Bing’s career, I have come to really appreciate the skill he has utilized in both adapting the cover songs for the dulcimer as well as writing blues songs for the dulcimer. The album is at first play a very curious and interesting listen. Subsequent plays are very enjoyable. Bing has excellent vocal skills and has proven on this album that he can pen very well written blues songs. Unresolved Blues will be a permanent addition to my collection and I plan to make a point to see Bing Futch perform live. 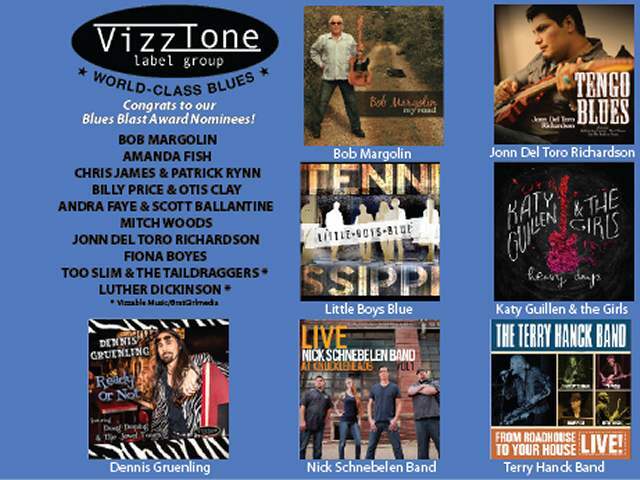 As indicated by his win at the International Blues Challenge, he is making a place for himself in the blues world, where for a time, he will be the only one with a dulcimer on his lap. 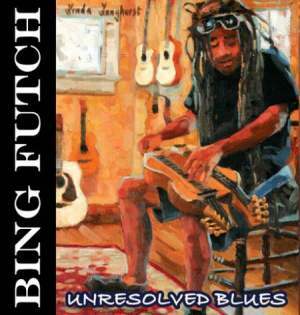 Unresolved Blues can be purchased on iTunes, Amazon.com, cdbaby, or on his website at www.bingfutch.com. 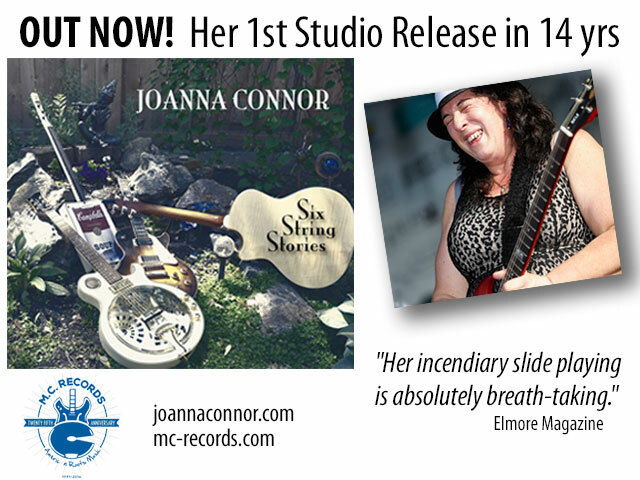 Reviewer Kim Derr a life-long blues lover originally from Pennsylvania who recently relocated to SE North Carolina. She left her career as an attorney to pursue blues guitar, bass and mandolin playing and photography interests. She enjoys all styles of the blues. Blues music is her passion, whether writing about it, playing it, listening to it or photographing musicians. There is a story in or behind every blues song and in the musical styles. Blues had her at the first twelve bars on an old guitar! 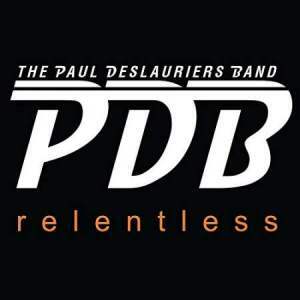 Based in Montreal, the Paul DesLauriers Band is a tight, three-piece power blues group who just missed walking away with the 2016 International Blues Challenge championship, finishing the worldwide competition in second place to the Los Angeles-based Delgado Brothers and 117 other acts in the band category. Led by DesLauriers, a gifted guitarist and vocalist who also adds piano and theremin – the electronic instrument best known for its use on The Twilight Zone TV show, the trio also includes 2105 Maple Blues Award bass player of the year Greg Morency, who doubles on conventional four-string and unusual eight-string instruments, as well as Sam Harrisson, a three-time Maple Blues nominee, Canada’s equivalent of the Blues Music Award, as percussionist of the year. DesLauriers is an Ontario native who co-founded Black Cat Bone, one of the top rock bands North Of The Border in the ’90s. 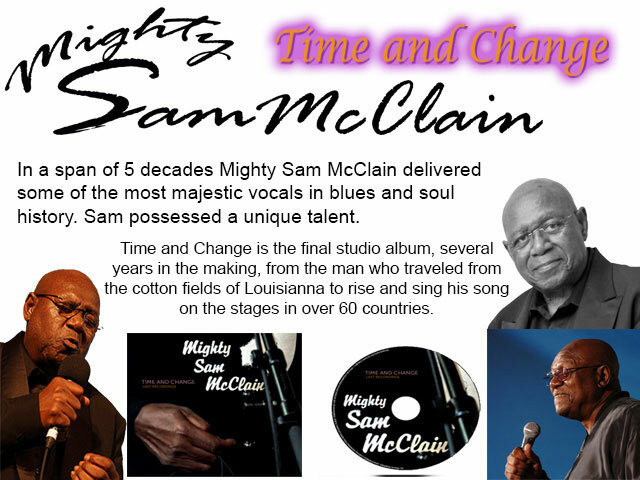 He’s recorded with Bryan Lee and Dawn Tyler Watson, Canada’s queen of the blues. Harrisson is the all-time record holder for the prestigious Lys Blues Awards, the province of Quebec’s top honor, a statuette Paul has captured five times in addition to his two Maple Blues honors. The band made their recording debut in 2013 with Enter The Gate, a joint project with sitar master Anwar Khurshid, which fused blues with classical Indian music. The current disc is a follow-up to a self-titled 2014 album that immediately rocketed to the top of the iTunes Canada blues chart. Their music blends rock with straight-ahead blues in a style reminiscent of such ’70s English groups as Humble Pie, Savoy Brown and Foghat. But they take the music to another level via modern stylings and attack that’s pretty much free of clichés. DesLauriers and partner Alec McElcheran composed the lyrics and the entire band created the charts for the 10 originals on this one. “Stewtro Rock (Just Got Back)” kicks off with an ascending scale before a powerful single-note run before it picks up steam into a driving blues-rocker as it professes “no more drivin’ blind/On an open road.” It concludes with guitar pyrotechnics. The aural texture changes into a much milder boogie for “I’m Your Man” and heats up again for “Ten Feet Tall” before “Still Under My Skin” comes across with a funky swamp-blues feel. Next up, “Wipes Away Your Sin” is a blues-rock ballad with a medium-tempo, syncopated military beat about fighting off tears in a lonely hotel room after the breakup of a relationship. The theme continues in the bluesy “Up In The Air” before the ensemble bursts out of the gate with “We Just Might,” a rapid-paced boogie of hope as a new relationship gets underway. “If I Still Had You,” a burning eight-minute blues, follows before the funky, two-part “Gonna Make You Move” uses clever lyrical sexual double entendre to bring the set to a close. Sure, there’s a little shredding going on here, but not much, and it’s taut and well under control. This is one tight, powerful band that deserves a listen, especially if your tastes run to blues-rock. Available through iTunes, Amazon or directly through the band website. The third release from The Mighty Mojo Prophets is another fine slice of modern day electric blues from the Long Beach, California-based band. Featuring 13 original songs, all co-written by singer Tom Eliff and guitarist Mitch Dow, RECORD STORE is also the first release on the Prophets’ new label, Mojo King Music, the band having previously recorded for Rip Cat Records and Delta Groove Records. Despite the modern recording values, there is a glorious sense of retro throughout RECORD STORE, from the wild abandon of the opening track, “Crazy Love” where’s Dow’s old-fashioned gnarly guitar meshes perfectly with the swooping harmonica of Tom Richard, to the West Coast swing of the closing instrumental of “All Thumbs”, which features some delicious chromatic harp from Richard and an inspired Junior Watson-esque solo from Dow. Eliff has an engaging voice, telling stories in his songs in a manner reminiscent of the likes of James Harman and William Clarke, both of whom are name-checked in the autobiographical title track, where Eliff sings about growing up in the mid-80s in Long Beach, and visiting Lamar’s Record Store “to get my blues fix”. “You might see Big Bill Clarke or maybe Icepick too,” sings Eliff over Dow’s funky, wah-wah rhythm guitar. 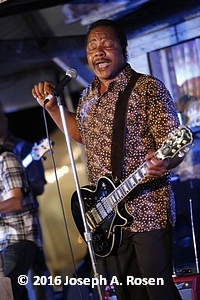 “I saw Snooky Prior lay down some funky old lowdown blues.” The intelligence, wit and awareness of Harman is clearly a strong influence on the Prophets, as can be heard in tracks like “Things Don’t Change” and “Good Girl Train”, the latter of which could be a co-write between Harman and Delbert McClinton. Eliff and Dow are an impressive song-writing team and RECORD STORE contains a wide range of blues rhythms and styles from the lazy shuffles of “Workin’ Man” and “Cherry Red” to the upbeat eponymous swing of “West Coast Girl”, while tracks such as “Strong Together” contain hints of soul music (and kudos to Mike Malone for the lovely organ solo on that song). Dow’s guitar is the dominant instrument on the album, and he mixes up his sound impressively, adding heavy reverb to “Wondering” and raucous slide guitar to “Bring It On Home” although he shares many solos with Richmond’s harp. Mike Malone’s piano and organ tends to be used more for subtle backing although, when he does take a solo, as on “Good Girl Train”, he more than holds his own. 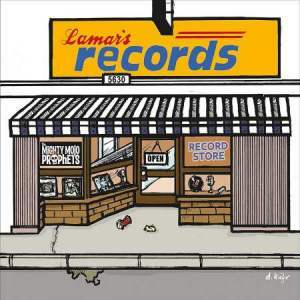 The Prophets are locked down by the top class rhythm section of Dave DeForest on bass and Al Ricci on drums, but the songs have an endearingly ragged feel to them, as if they were recorded live, which again adds to the slightly retro feel of the album. In “Spider And The Fly”, for example, Dow’s guitar solo sometimes hurries the rhythm and sometimes lays back just off the beat, which captures the listener’s attention all the more effectively. RECORD STORE is a very enjoyable release from a band that obviously has a lot of momentum behind it. Impressive stuff. 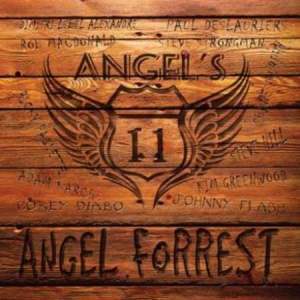 Angel Forrest is from Quebec and has been recording since 1996, in her native French as well as in English. On this album the material was all written by Angel and her partner Denis Coulombe with the express intention of featuring a different guitarist on each track. The players offer a range of styles from jazz-inflected to full on blues-rock so there is plenty of variety. The core band is Denis on rhythm guitar, occasional bass and Mexican style trumpet on the opening track, Sly Coulombe or Ben Clement on drums, Alec McElcheran on bass, Daniel Thouin on keys, Steven Rousseau on harp and a horn section of Nicolas Boulay on trumpet, Mathieu Mousseau on baritone and Frankie Thiffault on tenor sax appears on a few tracks. Angel’s voice has that slight touch of grit and it is no surprise to discover that she has played Janis Joplin on stage, even recording an album of Janis material. “Hangman” opens with Spanish guitar but quickly morphs into more of a standard rocker with guitar courtesy of Johnny Flash (great name for a guitar player!). New Orleans rhythms with horns and fine piano propel the impressive “All The Way” which Angel sings superbly, Rob MacDonald adding some subtle flourishes on guitar. Steve Strongman’s jazz-inflected guitar work fits well with the latin style of “Spoil Me Up”, Angel waiting impatiently for her lover to return. Ricky Paquette is featured alongside Steven’s harp on the fast shuffle “Hold On Tight” but things get moody on “Tumbleweed” where Dimitri Lebel-Alexandre plays pedal and lap steel which gives the tune a country feel. 2016 IBC finalist Paul Deslauriers and Denis play acoustic guitars on the ballad “Goodbye” before “Let Me Go” provides the longest and arguably strongest song on the set, a horn-drenched soul ballad on which Kim Greenwood’s guitar flourishes in the verses work well and his extended solo just manages to avoid going over the top. Two heavier tracks follow, neither of which were to this reviewer’s taste: Corey Diabo’s screaming leads on “Wildflower” fit the rocky style of the song but Shane Murphy’s histrionic playing on “Touch Of My Hand” is simply distracting. 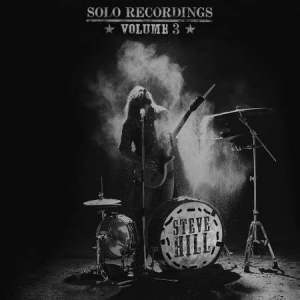 Steve Hill also plays some heavy guitar but it fits the song perfectly as Angel emotes about lost love on “Crucify” before Adam Karch brings the album to a close with some very pretty acoustic work on the fetching ballad “You And I”. Angel’s vocal work throughout fits the material well and the different guitarists offer a wide variety of styles which generally fit the songs well. In his native Canada Steve Hill has established quite a reputation as a one-man band, receiving nominations for Juno awards as well as winning the 2013 IBC award for best independent album for the first of his solo recordings. This is volume 3 in the series and is literally all Steve, no overdubs, no extra personnel. But do not go thinking that this is another solo acoustic album, as Steve plays plenty of heavy guitar, accompanying himself on two pedal drums and assorted percussion, including some hit by a stick taped to the neck of his guitar! At times the sound is almost heavy rock, as on opener “Damned”, or churning blues-rock like “Dangerous” though there are some acoustic tracks, including the fetching love song “Emily” on which Steve plays some delicate guitar or “Slowly Slipping Away” where Steve also plays some harp and provides a very convincing vocal on a song that takes as much from the folk tradition as the blues. However, Steve’s stock-in-trade on this album is the heavier tunes and “Rhythm All Over” is perhaps the pick of those with Steve playing a throbbing bass line as well as the core riff. 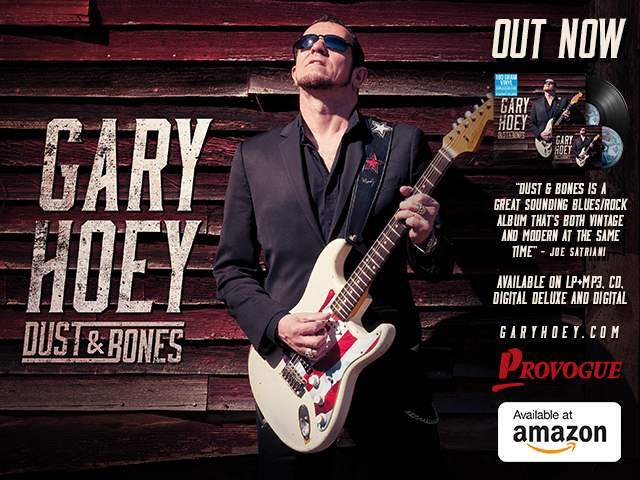 Steve closes the album with the moody “Walking Grave” which features some torrid slide work and some dark lyrics: “I rise up from the dead, let the seed become a flower”. Most of the songs are originals, either written by Steve alone or in partnership with J. Parlett. There are three covers which provide an insight into Steve’s influences. A medley of “Still A Fool/Rollin’ Stone” provides a gritty take on two of Muddy’s best known tunes and Steve repeats the trick with “Rollin’ & Tumblin’/Stop Breaking Down”, here credited as ‘Traditional’ though most blues fans would probably see these as Robert Johnson tunes. Steve’s slide work at the start is terrific before he picks up a frantic pace on his kick drums to drive the song along. In complete contrast Steve’s version of “Going Down The Road Feeling Bad” is a lovely acoustic reading of the song that takes the tune back to its country/folk/blues origins, different from the Grateful Dead version that most of us will know – another standout track. Steve’s ability to produce such a rich sound all alone is impressive and this album offers the variety of both acoustic and full-on electric music so will contain something for all tastes. 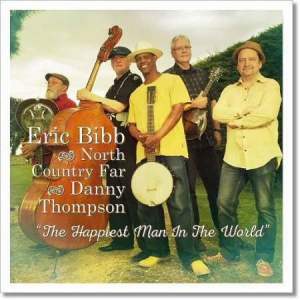 The Happiest Man in the World is a cool title for an album, and if you had a musical career like Eric Bibb’s you would probably be happy too! For this project Eric teamed up with English double bassist Danny Thompson and a few fine Finnish fellows from North Country Far, and the end result is 14 tracks of cool folk/country tunes with a tasty blues flavor. In case you are not familiar with the man, Eric Bibb was born in the Big Apple where he took up the guitar early, joining his father’s show while he was still a teenager. His serious devotion to his musical career resulted in a relocation to Paris (and later Sweden), and from his home base in Europe he has been touring the world with his band ever since. Along the way he cut three dozen of his own albums, and he has made countless guest appearances on others’ discs, earning serious credibility and a Grammy nomination. The musicians on Bibb’s latest CD are some of his friends from Finland, including Olli Haavisto on guitars, his brother Janne Haavista on drums, and Petri Hakala on mandolin, mandola, fiddle, and guitar. The aforementioned Danny Thompson also joined in, while Eric laid down the vocals tracks, the lead guitar lines, and the banjo parts. The studio sessions took place at The Grange near Norfolk, England, with Dave Williams behind the recording console. The fourteen songs on The Happiest Man in the World are mostly originals, and there is an overwhelmingly positive feel to the songs, which are mostly love songs with an overwhelmingly personal vibe. The band kicks things off with the title track and the folk sound is right up front with a clearly picked banjo, thumpy upright bass and a well-played slide guitar. The lyrics are an ode to woman who is there for her man, and Bibb has a nicely aged timbre to his voice that brings the whole thing together. Positive spins on relationships fill most of this set, making it a bit different than the usual blues fodder of deception, infidelity, and heartbreak. There is the story of a lady who does not mind taking the wheel (“Toolin’ Down the Road”), a suggestive list of agricultural chores (‘I’ll Farm For You”), the joy of making a life together (“Creole Café”), and the destiny of true love (“Born to Be your Man”). But there are a few elements of darkness to be found, such as country blues of “Tossin’ an’ Turnin’,” the thoughts of a man who is getting ready to lose everything and move on to greener pastures. The originals are good, but there are a few surprises tucked away in the playlist. One of these is the traditional “Tell Ol’ Bill” which has a lush sound and lovely backing vocals from Ulrika Ponten Bibb. Then there is a funky acoustic take of The Kinks’ “You Really Got Me,” complete with extra guitar work from Michael Jerome Browne and harp courtesy of Pepe Ahlquist; this is hands-down the best cover of this tune since Van Halen re-did it in 1978. The Happiest Man in the World is a cool album,with good songs, fine musicianship, and solid production values. 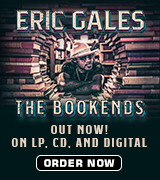 Eric Bibb and his friends should be proud of what they have put together, as they have managed to create something a little different than what other blues artists are producing today — check it out for yourself, and see what you think. You have missed your chance to see him in the U.S. this year as Eric is touring Europe until the December, but we can hope that he schedules another tour of the states sometime soon! 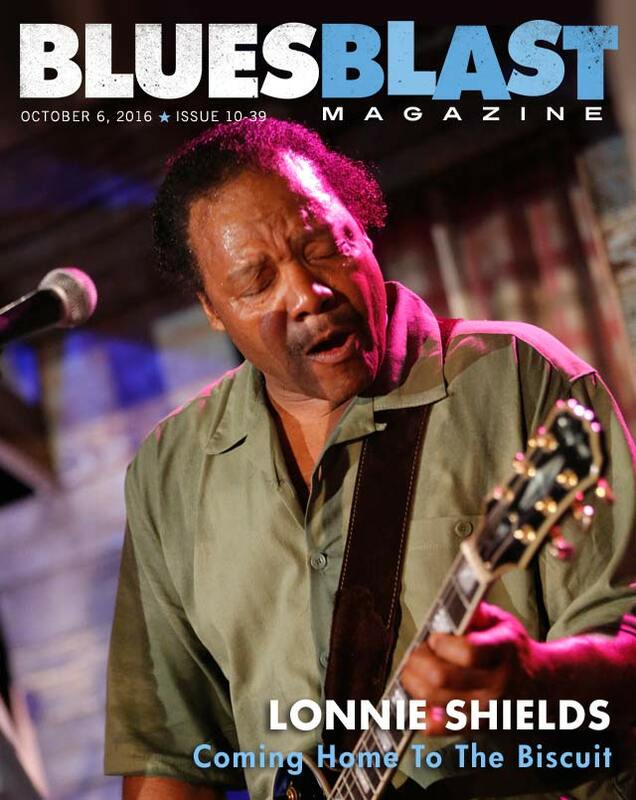 Singer/songwriter/guitarist Lonnie Shields didn’t start out as a bluesman. His gospel flavor he gleaned from The Greater Baptist Church as a youngster. He was a founding member of Shades of Black in 1970 at age 14 covering the funk and soul of Earth, Wind & Fire; The Average White Band; and Al Green. But it was Jellyroll Kings drummer Sam Carr, stepson of the seminal blues slide guitar player Robert Nighthawk, who talked Shields into playing the blues and touring with the Jellyroll Kings. Shields performed at nine of the first 11 King Biscuit Blues Festivals. 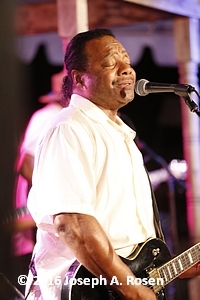 His first single “Cheatin’ Woman” premiered at the second King Biscuit Blues Festival in 1986. He played The Biscuit in 2014, plays again this weekend and will be on my Call and Response Seminar at the Malco Theater at noon on Saturday, October 8). “Helena, Arkansas when I was a boy was a very vibrant town. You couldn’t even walk in this town because there were so many people. You had to turn sideways just to get down the road, and the streets were full of people, and there were juke joints going on all the time. My uncle used to play harmonica with Sonny Boy Williamson, and this town was just jumping. Shields never actually met Sonny Boy, “My uncle used to run around with him and Dudlow, Houston Stackhouse and Curtis Peck. He’d come back blowing some of the stuff Sonny Boy learned him, and we used to have fun, and I never knew about the blues until my uncle really came around a lot blowing the harmonica, and that’s how I started listening to Sonny Boy Williamson on the radio at noon, listened to how he played the harmonica and sang. The Shades of Black were a 10-piece R&B band. “The band would tell me, ‘You sound like blues.’ And so I didn’t even know until I got with Sam Carr, these were blues chords. Sam Carr may have lured Shields into the blues, but it was B. B. King who sealed the deal. “What really turned my head when I listened to B. B. King singing “3 O’clock in the Morning” it sounded like he was very hurt. I was listening to the music and listened to the lyrics. They was telling a story. I just stopped listening to the music and started listening to the lyrics, and then I could find what the blues was all about was just people talking about their problems, hard times and hardships and all this here stuff. Shields plays guitar from the bottom up. “What it is is more like twisting and turning like somebody twisting strings and pulling and popping. There’s no picking. A lotta time I don’t even have to use the bottom finger. I use just my top fingers and do a lotta wild stuff. You have to see me. A lot of people didn’t think I could play the guitar the way I should play the guitar because I was kinda little strange the way I played because I incorporate the blues and funk together. (The Shades of Black) didn’t like that, and that’s one of the reasons they kept wantin’ to vote me out of the group. Shades of Black covered the Isley Brothers who had a young Jimi Hendrix as their lead guitarist early on. I asked Shields if he was influenced by Hendrix. “No, I wasn’t, but I listened to Hendrix through my brother-in-law. He was over in the Army, and he used to come back with a lot of Hendrix stuff. He had LPs. I actually listened to a lot of that, but I didn’t really like Jimi Hendrix because it was just too much guitar. I couldn’t get that Funkadelic stuff in my head. He was unorthodox. He was something different. “I was somewhat like him. A lot of people didn’t think I could play the guitar the way I should play the guitar because I was kind of a little strange the way I played. That’s what set me aside away from playing of a lot of different bands. People didn’t like the way I played because I incorporate the blues and funk together. They didn’t like that, and that’s one of the reasons they kept wantin’ to vote me out of the group. The church proved to be as powerful an influence on Shields as the blues, and to this day Christianity infuses his music and his attitudes about playing. “(I grew up in the) Baptist Church. It was always music. There was always a revival coming.” In both recordings and live performances, he mixes and matches. And he presents both genres with equal intensity. “Jesus is gonna come back and raise the roof,” he told me in 1996. “Ain’t nobody gonna be ready caught doing what they’re doing and not thinking about him, and the song (“Coming of the Lord” on Tired of Waiting) is really relating to the kids, trying to bring them back from the wayside and try and do something positive with their life and stop killing themselves and us and putting our lives in jeopardy. I think it’s the youths mostly that’s our biggest problem in the world today. “I don’t feel God has no quarrel with me long as man does things in moderation if man do things that do not hinder him to foul up the body, mind or soul. I was called to be a minister. My brothers’ a minister, and I didn’t deny being a minister, but I feel I could do more by going into clubs singing the gospel and relating to people on the road, trying to get people aware that there’s a second coming. 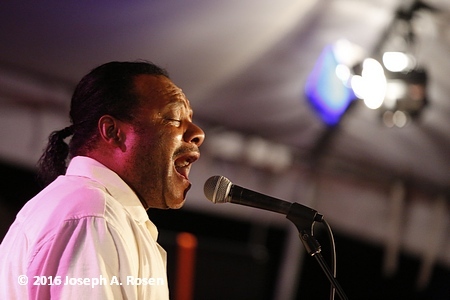 Maybe it’s that combination of the sacred and profane that helps give Lonnie Shields the incredible energy and emotion he pushes out in live performance. Whatever it is, every time I see him I have to remind myself again that, yes, that last concert wasn’t a fluke. He’s as electric and energetic as Buddy Guy on a good night, and I’ve never seen Lonnie on a bad night. “It comes from the heart. I play that way, and the people make me feel that way. And I give myself to God and all my stuff comes from Him. That’s the higher power. Whatever you want to call it, I feel it. I mean I close my eyes, and I just feel it. I don’t see a note. I feel the notes in my head. I just deliver. 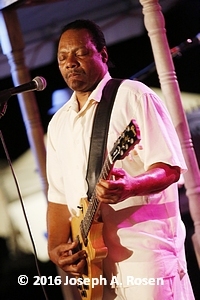 At age 60, Lonnie Shields defines himself as “a starving artist.” While Johnny Rawls produced two of his albums, a young Shemekia Copeland was guest vocalist on his self-defined best album Blue Is On Fire, and Portrait took the Living Blues Critics Award for Best Blues Album (New Recording) of 1993, he’s spent large parts of his career working day jobs in construction. Portrait is his best known album. It was a six-year effort that began as Rooster Blues’ first recording session in Clarksdale, Mississippi. The label’s president and founding editor of Living Blues magazine Jim O’Neal in a 1993 article in King Biscuit Time magazine called Lonnie “the brightest star to come out of Helena since the old ‘King Biscuit Time’ days of Sonny Boy Williamson.” That album was a Delta all-star sampler with guest appearances by Lucky Peterson; Eddie Shaw & The Wolfgang featuring Vaan Shaw; members of both Al Green and Bobby Blue Bland’s touring band; not to mention the Jelly Roll Kings’ Sam Carr, Big Jack Johnson, and Frank Frost. Shields says the record was delayed “because Jim did not have the money to put it out, and I really wasn’t even paid for the recording. I wasn’t paid for most all of my recordings. I think John Stedman (JSP Records) was very generous to me, but Rooster Records never had the money. You can’t pay somebody out of a cigar box for recording. So I felt I was held back for a while, and I was very agitated, and I told Jim I was agitated. “I call myself a starving artist really because it was so hard in a way. Sometimes you’d go to places that you think you’re going to play, and all of sudden the gig done fell out. Then, you’re all these many miles away from home, and you get up to go to the next gig, and you don’t know if that guy’s gonna be good or not. It’s been a long, long hard struggle as an artist being a blues man. “I’m kind of hardened by it because I showed that I gave my best years when I was young, and no one ever cared about it, and now I’m 60 years old now, and I’m still not getting any credit for what I’ve done, but I want the next generation to be able to get something form what they do in their music. To that end Shields dedicated all proceeds from his 2012 CD ’Cause the World Ain’t Been Good to You to the Child Life Department of the Children’s Hospital of Philadelphia to support children in dire medical circumstances and has worked throughout his career to help young people learn skills they can turn into employment as adults. “I went to their parents and asked could I take them to my job site and learn them how to paint and do carpenter work and brick work, and then I’d take four kids at a time, and I’d take them out on the job and try to learn them a trade which a lot of them thanked me for an the parents did, too, because it made a difference in their life to have money to go out, and buy their own school clothes and not have to be out in the street doing something bad. “We’d go to church and do stuff like that. So, I’d take them to a house where people wanted them to paint. I teach them how to put window panes inside of the windows and stuff like that, putting windows in and hanging doors. “I want to make sure what happens to me doesn’t happen to them. And I want to make sure that if anything I can do to help a young person I would. Visit Lonnie’s website at: www.lonnieshields.com.